Finely chop parsley and set aside. Crumble sheep’s cheese with your hands and add to a bowl. Add parsley and eggs. Season with salt and pepper to taste and stir to combine. 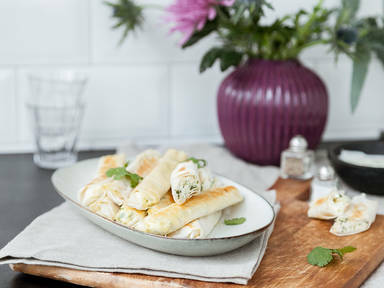 Place the filling on the lower third of a sheet of phyllo dough and roll up tightly. Dampen the phyllo dough with some water to make it sticky and seal the filling inside. Heat vegetable oil in a frying pan and fry borek rolls from all sides for approx. 4 – 5 min. until cripsy and golden brown. Let dry on paper towels and serve warm or cold. Enjoy!